The "Life from Soil" project is a collaborative approach of 9 partners from 9 European countries. They want to support local sustainability, rural communities and vulnerable target groups through tailored, open-source and tested education processes. The partnership represent all geographic parts of European Union and various non-formal and formal educators active in agricultural, horticultural and environmental sectors. Their target groups range from children, high school and university students through vulnerable groups of rural and city population as well as unemployed, seniors, prisoners up to own staff and teachers, trainers, educators involved in adult and youth education. The overall objective of the project is : Increase the skills and abilities of vulnerable groups of people to be self-dependent, employable, active and competitive in their effort to have and live a sustainable, fruitful and rewarding life. The project aims to produce 3 intellectual outputs : a best practice guidebook, modular training course and a demonstration testing site for practical evaluation of educational tools. 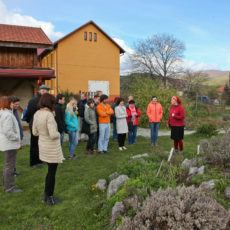 Through short term staff training and skilled trainer mobilities the project envisages active participation of 200 learners (60 own staff of partners, 60 educators, teachers and local activists, at least 60 high school and university students and at least 20 people participating in demonstration sites). The project will be organized in Work Packages whose management will be conducted by various project partners. The project activities in those work packages are primarily focused on design, preparation, testing and dissemination of educational tools ( best practice guidebook, modular training course and a demonstration testing site for practical evaluation of educational tools).